Lifetime has been on my GoodReads list for three years and my school finally added it to the library. It is such a quality addition to our collection. Telling the story of numbers and animals, readers get to learn cool facts, like, "In one lifetime, a giraffe will have 200 spots." The facts are fascinating and I actually hadn't heard any of them before. The illustrations are gorgeous and had me wondering if they were the actual number; are there really 550 eggs in the alligator drawing? 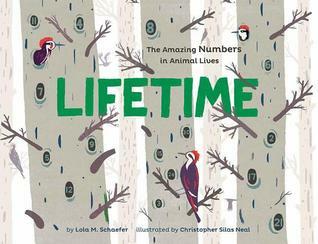 At the end, author Lola M. Schaefer goes into more information about each animal and teaches about averages. Reading this section could lead to more inquiry on students' part, trying to figure out some lifetime facts of their own.